An intriguing three-sided folly is a testament to one man's devotion to Catholicism and the number three. 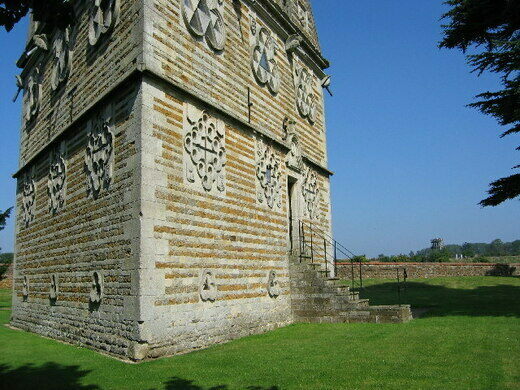 Constructed between 1593 and 1597, the Triangle Lodge was designed by Sir Thomas Tresham. The intended purpose of this unfinished Elizabethan building remains a mystery. This World War II airfield is the last place the bandleader performed before he disappeared. 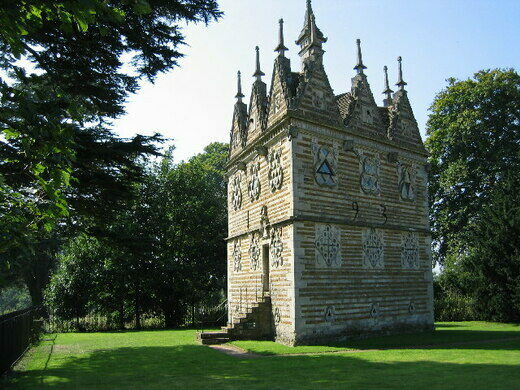 Each floor of this folly is comprised mainly of a hexagonal room, which leaves three triangles in each corner. In one of these corners is a spiral staircase, the other two are small rooms. Atop each wall sits three gargoyles, and above them are three pointed gables. Cast in the stone of the outer two gables of each of the walls is a symbol of importance. Among the emblems are the Seven-branched Candelabrum, the Seven Eyes of God, a Hen and Chickens, a Dove and Serpent, the Hand of God touching a globe, and a Pelican in her Piety. A broken inscription across the three middle gables, which are actually sundials, reads: Respicite, Non Mihi Soli Laboravi, “Mark ye, not for myself alone have I toiled.” Atop the three gables on each side is a three-sided obelisk, reaching toward the sky. The obelisk, too, has symbols adorning each side, including the Christogram “IHS”, Iesus Hominum Salvator (“Jesus, Savior of men” in Latin), a lamb and cross, and a chalice. 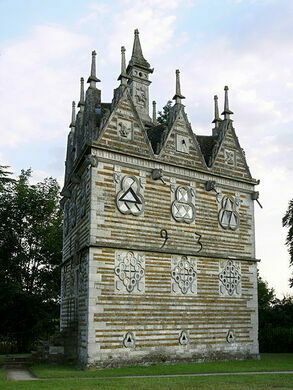 The building facade is covered in seemingly random numbers, Tresham’s initials, and a multitude of heraldic shields and crests. The trefoil, or three-leafed clover, features prominently on the building, this is because the trefoil is the main symbol of the Tresham family crest. Each of the windows on the second floor are trefoils with triangular panes within. Above the entrance is the number 5555, though the numbers’ appearance is odd, leaving some historians to speculate that it once read 3333. Above the door, but underneath the Tresham coat of arms lies the inscription: Tres testimonium dant, “The number three bears witness.” Some think that the inscription could mean “Tresham bears witness,” considering “Tres” was the pet name given to him by his wife. 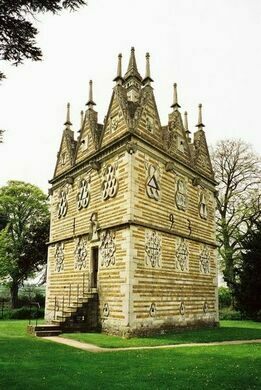 Successfully nestled away in the countryside to prevent discovery by Protestant authorities, the Triangular Lodge survived the period of persecution of English Catholics. Under a church hides a forgotten 13th-century ossuary containing the remains of around 2,500 people. The first German gnome who popularized the garden decoration. This tallest folly in the world began its life as an elaborate factory chimney. Remnants of a Victorian garden feature sitting in public woodland. Despite its lavish ornamentation, and wholesome lifestyle of its devotees, this mountain commune has faced its share of issues.